Announcement Welcome to Atomic Polish! We are a brand new company under the Oh Fer Cute umbrella. Our grand opening will taken place February 2019. Please contact us with any questions you may have! Current processing time is 1-3 business days. 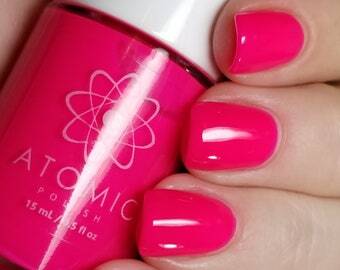 Welcome to Atomic Polish! We are a brand new company under the Oh Fer Cute umbrella. Our grand opening will taken place February 2019. Please contact us with any questions you may have! 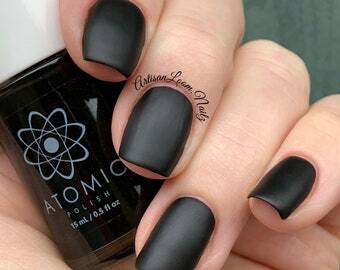 Beautiful nail color. Very fast shipping and polish was packaged well. Excellent seller. Thank you! I have been an Etsy small business owner since 2017 and have since flourished with my first shop, Oh Fer Cute Vinyl. My focus with that business is glittered drinkware. As a side effect, I have BILLIONS of types of glitter. I was trying to figure out a way to use my glitter another way and stumbled across nail polish. I had no clue indie polish was a thing until then. I did some research and decided I wanted to try. Lo and behold, polish making involves all of the beautiful things in life. Glitters, holo, color shift, chameleon, and opals gallore. Since then I was hooked. I have spent months perfecting my formulas and deciding on colors to offer! As for the name, it stems from my love for science. I have a BSc in Biochemistry so I have a close relationship with all things chemistry and biology. It only seemed fitting to base my polish off of my background! I even have a carbon atom tattoo that I got when I was a young adult. Hello! I am a mom of two boys, wife, and home business owner! I opened my first Etsy shop "Oh Fer Cute Vinyl" in 2017 with a focus on glittered drinkware. I am one that is never content with just one thing, so here I am, an indie polish maker!